Angie is the only person who lives nearby me AND shares many interests with me. We both quilt, craft and scrapbook. I have to say it is SO wonderful to have a neighbor that I feel so comfortable with! As much as I am into quilting, Angie is into scrapbooking and rubber stamping. She is extraordinary! So much so that she has parlayed this talent for creativity into being a Stampin' Up! representative. I wanted to use an delicate airy design for Angie and eventually settled on combining two different designs to achieve the effect. Because I chose to have rounded corners on this blanket instead of square corners, I needed a curving design that would match the curve of the corner. I found the first design, a circular floral frame, at Oregon Patchworks, Hallet House Designs. Unfortunately, I can't find the specific design in her selection, although I'm fairly positive it came from either the Floral Frame 1 or Floral Frame 2 category. It very well could be that the freebie sample selection has simply changed with time. I sliced the circular design in half but discovered that a perfectly circular design didn't work as well as I thought it should have; it actually curved too much! 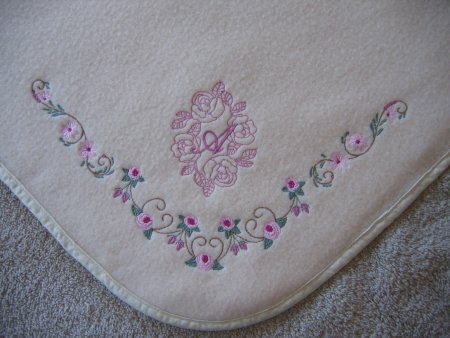 I wanted to add on some floral sprays to either side of the circular design so the embroidered design would be larger and more in proportion to the blanket. My solution was to take the end motifs of the circular design, separate and rotate them so they eventually ended up laying on their "sides". This allowed me to snuggle the floral sprays up to the end motifs and have it look nice. I also used three colors of pink for the flowers instead of the two that the original design called for. I made the roses a light pink, the rosebuds a medium pink and the centers a very dark pink. The floral sprays on the end of the circular design came from Pearly Designs (which is not in existance any longer), in the Bullion Rose Font category. I changed this design from the lovely monochromatic colors it came in to the multi-color result you see above. I made the leaves, French knots, flower petals, flower centers and the vine/scroll all separate colors, as I had wanted to incorporate the colors from the first design in this one so it would look coordinated. That left me with the question of what to do for Angie's name. I could always spell out her name, as I had done on my previous blankets, but as I leafed through my alphabet printouts, I rediscovered a lovely redwork alphabet from Ann the Gran, in the Free Design section, Alphabet cateory. This specific one is Rose Echo by Jodi Coffing. It stitches out beautifully. Then, in keeping with my desire to have unobtrusive labels on fleece blankets, I embroidered on a 3/4" satin ribbon with one of my favorite small fonts, Small Line from Sew-n-2-U. Her tiny font selections are superb ... this is one of the very few fonts that I have purchased.